According to Walton Enterprises, Inc. (“Walton De-Ice”) one of the world’s most notable pay TV services has updated its satellite Earth station with the latest Walton Hot-Air Plenum De-Ice systems that have been installed on two 11-meter satellite uplink antennas at the network’s main US broadcast facility outside of New York. Bill Walton, President of Walton Enterprises Inc. shared that their legacy of providing Earth Station Antenna de-icing and weather protection systems for this premiere cable TV brand, dates back 25 years. They designed the latest systems to provide customers with the most efficient energy consumption options for their business. He added that they are delighted that this top brand cable programmer with services in over 150 countries has decided to continue to rely on Walton De-Ice products in order to protect its satellite transmissions. 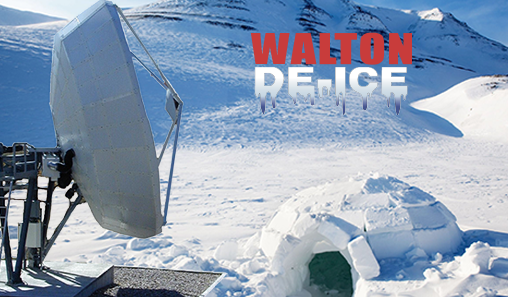 Walton’s Hot Air De-Ice systems, including the company’s unique Hot-Air Plenum enclosure installed on the rear of an antenna, provide consistent and cost effective antenna de-icing solutions that are flexible with electric, natural gas, and liquid propane gas heater options. Walton Hot Air De-Ice systems heat the entire antenna reflector uniformly, which minimizes reflector distortion that can cause signal problems, especially at higher Ku- and Ka-Band frequencies as opposed to electric pad heater systems that cause reflector distortion. Walton will be demonstrating their latest in gas and electric heated hot-air Plenum systems for large antennas, as well as their Ice Quake, and Snow Shield solutions systems at NAB this week at exhibit OE-907.